Home > Blog > Uncategorized > What Kind of Fume Hoods Are Available to Today’s Labs? Radioisotope fume hoods: When laboratories work with radiolabeled compounds or process like C14 radiolabeling, it’s important they have a fume hood that is specifically designed to protect people from radioactive materials. These fume hoods are generally made from stainless steel and have covered corners to help effectively remove harmful reagents from the air. Ductless fume hoods: Using an activated carbon filtration system, this type of fume hood actually absorbs fumes and vapors from chemicals. These fume hoods are becoming more popular in today’s labs because they actually recirculate air into the lab area once the harmful fumes are removed. 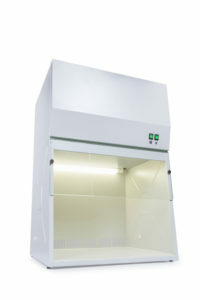 So not only do these fume hoods adhere to GMP standards, but they’re efficient as well. Non-bypass fume hoods: This is a conventional fume hood that uses a lower sash so those in the lab are offered more protection. But because they have a smaller opening, the air is pulled into the hood faster. With these types of fume hoods, it’s important to have just the right balance between the height of the sash and the size of the opening so the fumes can be pulled out of the lab effectively. Reduced air volume fume hoods: Using a smaller blower and sash stops, this type of fume hood reduces the air volume being pulled into the hood. And while this hood significantly reduces the amount of energy used to remove fumes, lab technicians have to be more careful when using it. So a smaller range of experimentation has to be traded off for saving more energy. As you can see, there is a wide variety of types of fume hoods. Having options for fume hoods allows labs to continue to adhere to GMP standards while ensuring they have the right hood for their experimentation needs.